Perugia (ITALY)--ILEXSOFT today announced the release of HighDesign 2017.2, an update to their professional computer-aided design (CAD) software, available for Mac and currently in beta testing stage for Windows. This new version focuses on project documentation and improves the workflow with a clearer organization of the tools, now grouped by function: selection, sketch, documentation, design and view. This change also includes the introduction of a new dedicated Annotation tool alongside the Text and Dimension tools. Annotations can now be associated to a parent element and offer more customization and editing options for greater flexibility. "A more productive design process and accessible functions are constanty high priorities in the design community," said Andrea Suraci, co-founder at Ilexsoft. "The coherent organization of the tools reflects the evolution of HighDesign into a solution capable of joining the flexibility of traditional CAD practices with a BIM-oriented mindset." Annotations with linear, curved, circular leader line or no leader; the ability to rotate the label, define its size, shape, padding; option to associate the text note to a host element. Zero-suppression options in drawing units, both for leading and trailing zeros and metric and imperial units, for better integration with office and national standards. Unified and improved interface for option dialogs. Option to include the project symbols in the document, thus making it independent of the local library of resource and easier to interchange. Enhanced alignments with automatic mid-point definition. Better compatibility with drawings exported from ArchiCAD. 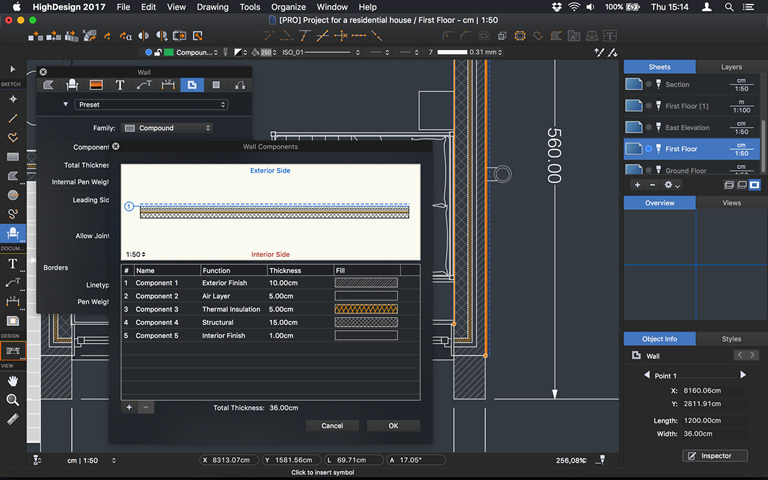 Learn more about the new features and improvements in HighDesign 2017.2. 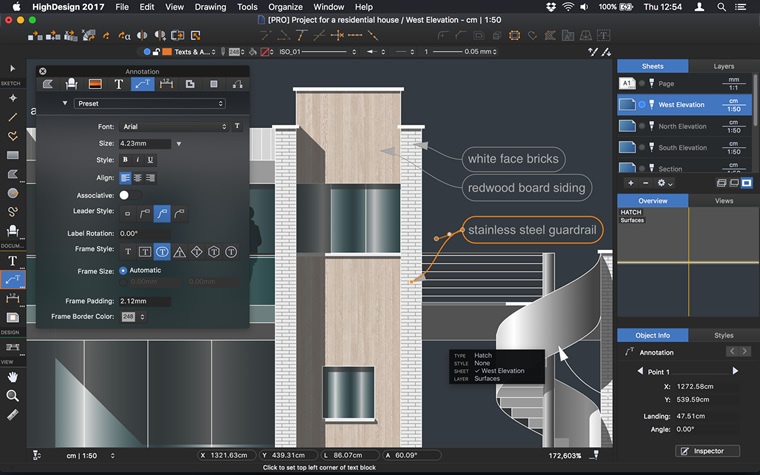 HighDesign is the alternative, full-featured 2D computer-aided design (CAD) software that combines advanced drafting and design tools with a modern, efficiency-oriented user interface designed to assist the user in all phases of the creative process. HighDesign has been developed from the ground up as a new product aimed at satisfying the actual needs of design professionals, and has grown to be a well recognized and appreciated app in the Mac community, actively used in more than 40 countries worldwide by individuals, firms and institutions. HighDesign LT 2017 and HighDesign 2017 run on Macs with macOS Sierra, OS X 10.11, OS X 10.10, OS X 10.9 and OS X 10.8. HighDesign for Windows is currently in the last stage of internal beta testing. HighDesign LT is available for 69.99 USD, and HighDesign 2017 comes in two main editions, Standard for 199.99 USD and Pro for 299.99 USD. A third option, called "Professional Plus", offers two Pro licenses at the convenient price of 499.99 USD. Yearly renewals for existing customers are available starting at 99.99 USD. A free, thirty-day trial is available from http://www.ilexsoft.com/downloads/. One-year educational licenses are available free of charge for qualified students and teachers. More information at www.ilexsoft.com/educational/. Founded in 2003 and based in Italy, ILEXSOFT is committed to creating innovative solutions for the architecture, engineering and construction (AEC) design community by developing advanced software with a focus on user experience characterized by simplicity and elegance. ILEXSOFT's vision is to create modern software that is enjoyable to use and tailored to the actual needs of professionals, in which the user interface plays a central part by translating the complexity of building and product design into a smooth workflow. Copyright ©2017 ILEXSOFT Sas. All rights reserved. AutoCAD and DWG are registered trademarks of Autodesk. All other identifiable marks are the property of their respective owners.